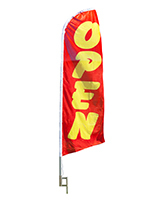 Each Advertising Flag is Made from Polyester, Making the Material Lightweight. The Sign Display is Large Enough to be Seen from Afar. 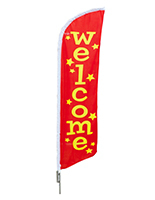 This Advertising Flag comes with Lightweight Aluminum Pole. Easy assembly requires only one person - Watch Video! The advertising flag can be place into any soft surfaces. 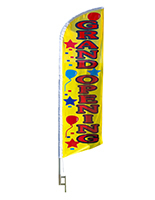 The banner display can be used for retail, wholesale and even private businesses! 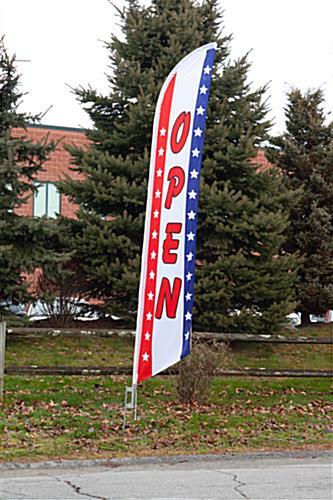 Each patriotic advertising flag comes with an "OPEN" message on the sign. The feather banner has an American flag color scheme. 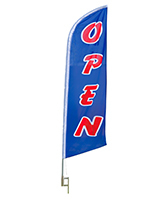 Each open advertising flag also come with stars and stripes, giving the sign a patriotic appeal. The feather banner is 14' tall and 27"w, making it easier to see from afar than a-frames, or similar outdoor advertising displays. 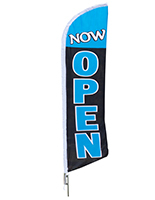 This open advertising flag that is constructed lightweight and wrinkle resistant polyester. The feather banner material also helps to keep the cost of the display down. The printing process is completed on one side of the canvas; the ink is dyed through so the reverse image can be seen on the back side. This allows the feather banner to be visible even in windy conditions. 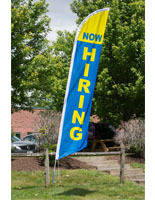 Each advertising flag can be used at auto body shops. 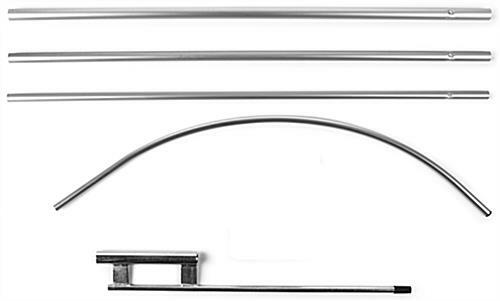 The aluminum pole is light, making it easy to transport. 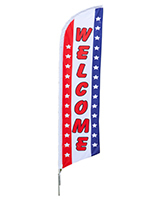 This patriotic advertising flag sells at a fraction of the cost when compared to fiberglass. Assembly of this feather banner only requires one person. 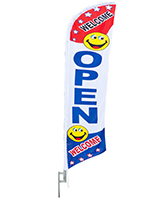 This open advertising flag comes with a durable metal stake. The metal spike is 31" and can be driven into soft ground as far as two feet, making the entire display more stable. The metal stake is durable, and will last for repeated use.